Prof Dino Jaroszynski (dino [at] phys [dot] strath [dot] ac [dot] uk), Dr Ranaul Islam and co-workers in the Department of Physics at the University of Strathclyde will use ARCHIE-WeSt to simulate nonlinear laser-plasma interactions in 3-D, enabling them to advance their work in the development of compact X-ray sources based on laser-plasma wakefield acceleration (LWFA). This technology has great potential to produce next-generation, compact X-ray sources for use in Science, Technology and medicine. 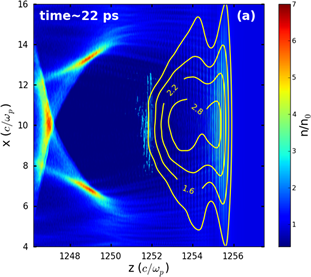 LWFA electrons are accelerated in a plasma density wave generated by a very intense laser pulse. Electrons that are accelerated in the wakefield also oscillate transversely and emit very bright X-rays and even Gamma rays (Nature Physics 7, 867 (2011), S. Cipiccia et al.). This synchrotron-like radiation occurs in a “wiggler” formed by the electrostatic forces of the plasma wave. As a first step to put LWFA on the map alongside conventional accelerators, they have undertaken studies of the beam emittance and shown that they are the same or better than a conventional linear accelerator (published in Phys. Rev. Lett. 105, 215007 (2010), E. Brunetti et al). Numerical simulations on Strathclyde’s existsing HPC machine have used the OSIRSI particle-in-cell (PIC) code (R. A. Fonseca, et al. Lecture Notes in Computer Science 2331, 342 (2002)) and reduced models developed at Strathclyde. PIC codes help in understanding the experiments by providing access to parameters that are difficult to measure but also help plan experiments and understand the data from them. Furthermore, they allow methods to be develop to enable control of the trajectories of the electrons within the plasma wakefield, which allows optimisation of the properties of the X-rays generated. Figure: The laser-plasma wakefield accelerator requires only an intense laser pulse and a puff of gas. Electron are self-injected from ambient plasma into the ‘plasma bubble’ and accelerated to high energy. As they accelerate they also experience the force of the electromagnetic field of the high-intensity laser pulse, which acts as an electromagnetic wiggler that resonantly excites large-orbit betatron oscillations of the bunch. The contours show lines of constant vector potential while the colours represent different electron densities after time 22 picoseconds evolution in the bubble.